Sosumi Records teams up with We Rave You and 1001 Track-lists to bring you 4 hours of the finest Tech, Tribal and Latin grooves from Kryder and the Sosumi family! 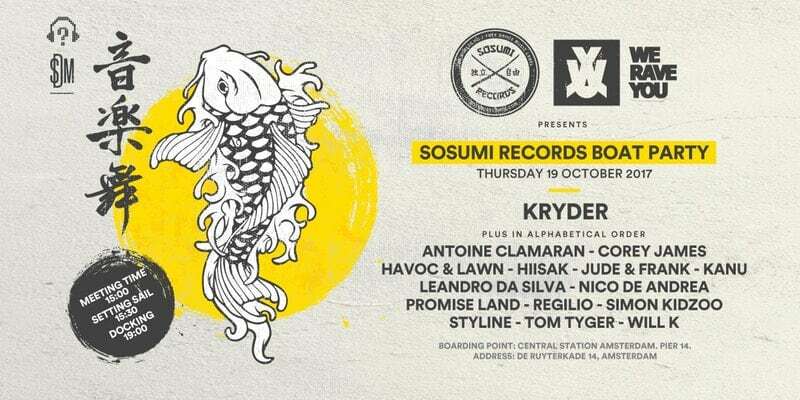 Join us on Thursday 19th October as we set sail around the canals of Amsterdam bringing you 8 special Back to Back sets onboard the Sosumi ADE Cruise! Joining Kryder will be Sosumi family members Antoine Clamaran, Corey James, Havoc & Lawn, Hiisak, Jude & Frank, KANU, Leandro Da Silva Dj, Nico de Andrea, Promise Land, Regilio, Simon Kidzoo, Styline, Tom Tyger & WILL K!